The 12May2015, 7.3 earthquake in eastern Nepal was not completely unexpected. When we had the December 2004, 9.1 Indian Ocean Earthquake, there was similar 8.6 shock in March 2005. There were also two 8+ events in 2007. So once the beast wakes up, it will take its own time to settle down. We can do precious little to change this except either to get out of the way and live in safer places in peninsular India or, if that is not an option, to live in houses that will not kill us during a great earthquake (magnitude 8 and above). Today's 7.3 earthquake appears to be identical to the 7.8 event. Same fault plane at almost identical depths. 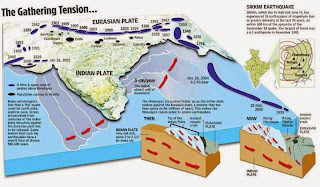 The fault that got active is the basal decollement fault of the Himalaya called the Main Himalayan Thrust. This is a fault that is present at the base of the Himalaya and extends from Kashmir to Arunachal Pradesh. Obviously, it is present below us in the Darjeeling-Sikkim Himalaya too. All the GPS work people have been doing in the Himalaya tells us how much this fault is slipping per year in different parts of the Himalaya. It was about 18 mm/year in the Nepal Himalaya and looks like it is about 16 mm/yr in Darjeeling-Sikkim. Imagine a beaker filling up with water at this rate. So the question is when will the beaker completely fill up? Once it does, nature empties it out in an event like the Nepal 7.9 earthquake.After that it starts filling up again. system. If this sudden addition causes the beaker to fill up in an adjacent region,another event would occur. Strictly speaking it is not an aftershock and a separate event by itself with its own aftershocks. However, it is an event that is triggered by the main event. 2. The beaker did not empty completely during the 7.9 event. In that case the beaker simply empties itself in two events rather that one. This is definitely better than having a single bigger event. Two 7+ earthquakes are better than one 9 event! The aftershocks of the 7.9 event showed that the earthquake rupture was propagating east. In fact today's event was very close to the region where we saw a 6.7 aftershock earlier. Would it trigger an event in Darjeeling-Sikkim? It could, if we think the first scenario was operational. Yes! I totally agree with you, having an earthquake on the decollement or the Main Himalayan Thrust in the Darjeeling-Sikkim Himalaya would be our worst nightmare. We have been very lucky. Nature has given us three warnings! September 2011 and the 2015 Nepal events. All projections seem to point to us and say that we could be next. We need to get our act straight! The NIMBY (not in my backyard) syndrome may no longer be applicable to us! The writing on the wall is writ large and clear. Increasingly and every year, disasters in and around the Himalayas (hydrological and geo) are taking a huge toll both in terms of human lives and economic losses. Yet, despite 'the three warnings' Prof Mukul talks about or the recent Kashmir and Uttarakhand disasters I am sure nothing much will change and we will continue our 'normal activities' as if nothing ever happened. As you mentioned the best option for people residing there would be to ensure houses are Earthquake resistant. Unfortunately, we are not sure of that. Lately, new construction is rampant in the District, and it would appear illegal in many places, precarious in some. Is the local Administration taking pro-active steps to minimize the risks? Either we be conveniently fatalistic and say nothing can be done or we take the bull by the horns. Do a risk assessment, mark all below earthquake resistant standard buildings prominently, get them retrofitted by the owners or else demolished. Relocate buildings on hazardous slopes. Create open safe spaces in crowded areas. Revise all building standards - just don't allow more than 3 stories. Go back to using wood and ekra/wood walls. Innovate and popularise earthquake resistant building design.